“Green, that’s what it’s all about,” Larry says as he shows me the eco bag that TIG is handing out at the VMworld 2008 show. Many of the booths say “Green IT” right on their signs. Virtualization can contribute to Energy Efficient IT in a number of ways, not the least of which is consolidation and containment of servers, thus reducing power requirements, but also the associated savings in data center cooling. From the initial registration for the conference, there has been an emphasis on Green. During the registration process, there is a discussion of transportation options to Las Vegas and their carbon footprint implications. Upon arrival, the notebook that attendees received comes with a pen made from recycled cardboard and a wooden clip. 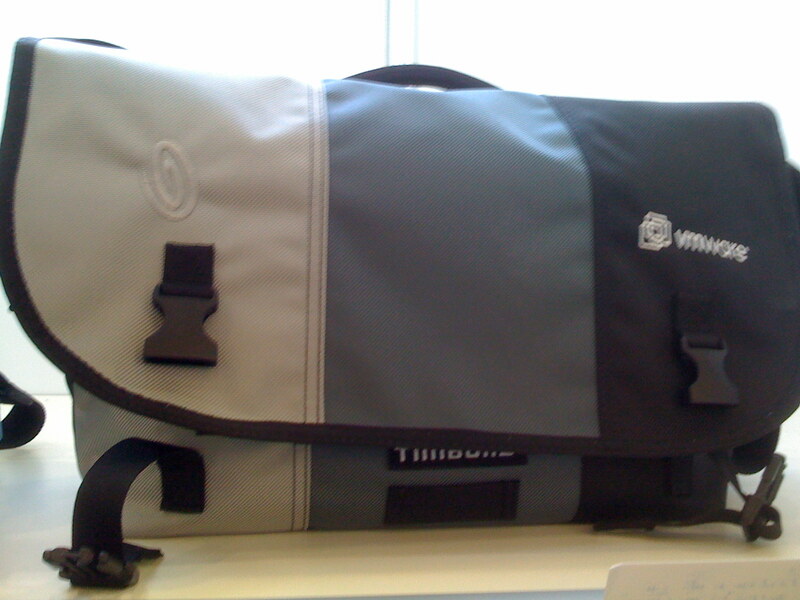 In the VMware Store on premise, there is a Timpuk2 messenger bag for sale. It’s a special limited edition of 75, made from the recycled banners from last year’s VMworld 2007 in San Francisco, available in blue, black, orange and green. The beanies are made from recycled cotton, and the polo shirts from recycled polyester. No new polyesters need give their life to make a new polo shirt.